Here’s our fantasy premier league captain tips GW34 article where we look at ways of assessing the best captain pick for the gameweek. We look at the fixtures, the bookies odds, the FPL advice site polls, who the FFGeek contributors are captaining, some stats and the FFGeek choice. The odds are for £1 invested up to £2.40. They assume the player starts and ignores assist potential. Btw, the FFGeek poll and site 2 and 3 asks who will you captain. Site 4 is silent. Site 1 asks who is the best captain. Site 4 had Kane in the voting. The others didn’t. With European fixtures next week and Man City and Spurs delicately poised it seems possible that rest related rotation will occur. With Son the likely CF going forward he becomes a very important player so Pochettinho could conceivably rest Son and hope the job gets done with Llorente. It’s impossible to know what’s going to happen here. Geek update. With Poch not optimistic about Alli for GW34 and Lamela out and Kane out that makes it more difficult for Son to be benched especially if they play 4-2-3-1. There’s no doubt in my mind that Duffy will play both games given that Brighton are only 5 points away from the relegation zone. Overall it looks pretty good. Returns in 8 of 9 games. A really strong PPG. Underlying stats are reasonably good too. Interestingly his position is less important than you’d think. Everything is better without except for his xG. Make of that what you will although I’ve limited the data set to 3 games without him using this method. It doesn’t get much worse than that. Over the season away from home, surprisingly they are 14th in xG conceded but 18th in goals conceded. My recent form article though paints a worse picture. Over the last 10 gameweeks, home and away they are 18th in xG conceded and 19th in goals conceded. So impressively Duffy has returned a goal or clean sheet in 6 of the 9 games. However despite all those clean sheets being 1-0 he’s only got bonus points in 1 of those games. That’s fairly disturbing. Interestingly Ryan has got bonus points in 4 of the 5 clean sheets. By the way it’s worth noting that Brighton only have 6 clean sheets. On the goal threat side it’s 1 goal in 9 games although the xG and shots aren’t too bad. He gets a shot in most games. Over the season away from home, they are 9th in xG but 14th in goals scored. Gametime wise there has to be some risk that Son could be rested with the midweek Wednesday Champions League tie still winnable. Hard to imagine that Duffy won’t play both games. The bookies have Son at £1.61 to score but that assumes he starts. It’s difficult to compare stats but in points per match v non top 6 Son is 8.13 and Duffy is 4.78. Over 2 matches Duffy edges that. On the stats I have it’s there doesn’t appear to be a Kane or positional effect. At the moment I’m not sure. I’m not wild about going against the polls especially when Huddersfield are involved. However it remains a risk that Son as anyone with UCL games could be rotated. Geek update. 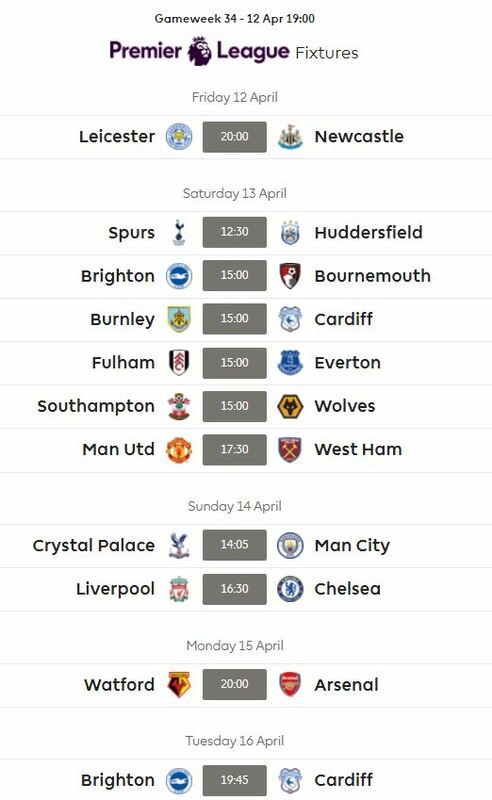 With Poch not optimistic about Alli for GW34 and Lamela out and Kane out that makes it more difficult for Son to be benched especially if they play 4-2-3-1. 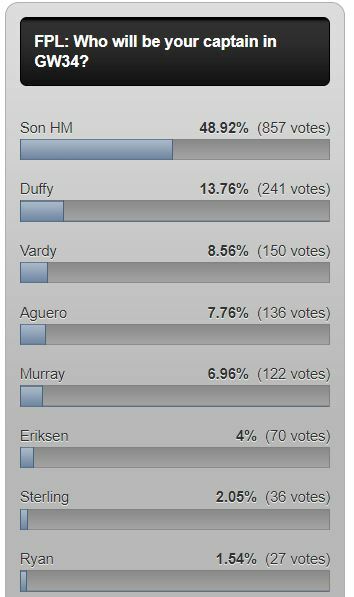 However, the fact that Spurs fan and FFGeek contributor Joseph Crilley is currently on Duffy when his team is playing Huddersfield says alot. However impossible to predict you just have to take your pick and take your chances. Duffy takes away gametime risk and there clean sheet record is good but his bonus and the chances of a goal could be better. Cardiff away from home don’t have great attacking stats though so there remains a good chance of a clean sheet there. I haven’t ruled out Ryan as an option yet just to throw something out of the blue. Only Burnley and Fulham concede more shots than Brighton and with Ryan getting bonus with clean sheets it doesn’t sound such a stupid idea. Also if they get no clean sheets then at least you have save points as a hedge. Obviously the dream with Duffy is a clean sheet, goal and 3 bonus which is the 11 pointer you hang out for. I’m going to do a seperate article on the FFGeek readers wildcard team. I actually think I will go with Duffy now. 5 of Brightons 6 clean sheets have been at home and with 2 home ties this week, the chance of a clean sheet in one must be fairly decent considering the opposition. Chelsea will beat Liverpool with Eden Hazard to score.